Proper nutrition can benefit you in a number of ways; increased energy, improved immunity, glowing skin, mental clarity, and a lower risk of heart disease and stroke. How often, however, do you consider how your diet influences your oral health? Your diet can impact your risk of cavities, enamel health, and gum condition. Healthy foods provide an environment that can restrict inflammation and infection. 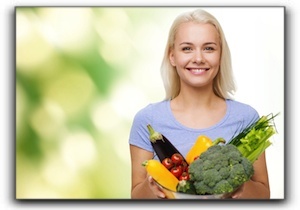 Vegetables, fruits, legumes, and nuts are the prime choices for oral health. Calcium-fortified beverages, milk and other dairy products provide vitamins, minerals, and calcium that aids in keeping teeth, bones, and gums healthy. Eating crispy fruits and vegetables, such as apples and celery, will help clean your teeth and gums. A healthy diet contains all the vital vitamins and minerals, and the most important mineral for teeth is fluoride – especially for kids. Between the ages of 6 months and 16 years old, both the primary and the permanent teeth come in, therefore adequate fluoride is critical. Don’t forget, however, that too much fluoride is detrimental. Dr. Clint Blackwood can counsel you on the specific dosage of fluoride for your child, taking into account whether your municipal water is fluoridated. Even though adults’ teeth have already formed, fluoride aids in remineralizing weakened enamel to a degree. This powerful mineral is applied to teeth during comprehensive dental cleanings at Salt Lake Dental Care – Clint Blackwood DDS and daily with fluoride toothpaste. Bacteria that causes enamel-destroying plaque love a steady diet of sugar – from soda, candy, and even fruit juices. When enamel wears away, the teeth become vulnerable to decay, cracks, and discoloration. Sugary foods that are especially detrimental are those that get trapped in the spaces between teeth and the miniature pits and cracks in the molars. Candies that are chewy or hard can lodge in these spaces and allow for the bad sugar to have direct contact with enamel until brushing occurs. Sticky candy can also damage braces and retainers. More than one retainer has fallen prey to sticky caramel or hard taffy. I’m Dr. Clint Blackwood, and I have a full-service dental practice in Murray. Helping my dental patients stay healthy is important to me, and so is helping them achieve the smile they want through development cosmetic dentistry procedures such as veneers, teeth whitening and cosmetic dental smile makeovers. Salt Lake Dental Care – Clint Blackwood DDS in Murray has been serving the Salt Lake City area including Sandy, Taylorsville, and Draper, since 2005. Please contact us at 801-938-8855 if you are looking for quality dental care from a local Murray dentist with the experience, expertise and personalized attention you deserve.